Click on 3 dots on the top right hand corner, go to Settings, and set the Pings count to 100. Click on Ping to start the test. 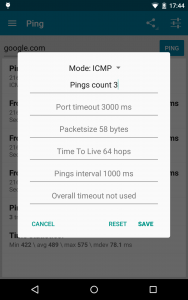 The test will stop automatically when it hits 100 pings. Please take a screenshot, it is important to include the statistics at the bottom in your screenshot (Sent / Received / Lost / Loss%). Now repeat using the DNS name: GW and hit “Start“.